…Britain stands out as a paradoxical country. Non-Muslims there have strikingly more favourable views of Islam and Muslims than elsewhere in the West. For example, only 32 per cent of the British sample viewed Muslims as violent, significantly less their counterparts in France (41 per cent), Germany (52 per cent) or Spain (60 per cent). In the Mohammed cartoon dispute, Britons showed more sympathy for the Muslim outlook than did other Europeans. More broadly, Britons blame Muslims less for the poor state of Western-Muslim relations. 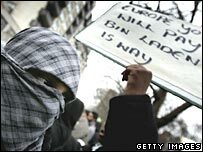 But British Muslims return the favour with the most malign anti-Western attitudes found in Europe. Many more of them regard Westerners as violent, greedy, immoral and arrogant than do their counterparts in France, Germany and Spain. I'm all for tolerance - with one exception - tolerance of all but the intolerant. In not one Muslim population polled did most people believe Arabs carried out the September 11, 2001, attacks on the US. The proportions range from a mere 15 per cent in Pakistan holding Arabs responsible to 48per cent among French Muslims. Confirming recent negative trends in Turkey, the number of Turks who point the finger at Arabs has declined from 46 per cent in 2002 to 16per cent today. In other words, in each of these 10 Muslim communities, most view 9/11 as a hoax perpetrated by the US Government, Israel or some other agency. Ignorance combined with certainty is worrying - don’t they all know it was the Reptiles for crying out loud? I'll end with a half remembered pithy aphorism which someone smart once said (I can't be bothered to track the quote down): the malady of the ignorant is to be ignorant of one's ignorance. ...there is enduring belief in democracy among Muslim publics, which contrasts sharply with the skepticism many Westerners express about whether democracy can take root in the Muslim world. Pluralities or majorities in every Muslim country surveyed say that democracy is not just for the West and can work in their countries. But Western publics are divided - majorities in Germany and Spain say democracy is a Western way of doing things that would not work in most Muslim countries. Most of the French and British, and about half of Americans, say democracy can work in Muslim countries. Tagged - Conspiracy Theory, 9-11.